I was so close to putting together a blog post last night, and then just got caught up in watching a few of my favorite shows on the DVR. The kind of shows that I have to actually pay attention too, as there is so much going on. If I were to work on a blog post while watching, I would have to watch the show all over again tonight, as I would have no idea what had happened. 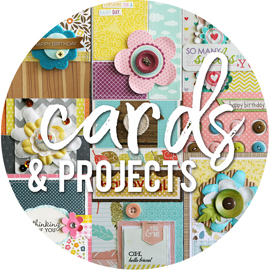 For my April project for Kerri Bradford Studio, I thought I would make a few cards. I've been creating lots of layouts lately, and wanted to work on a smaller canvas. Of course, when I say I'm going to make a few cards, it usually means that I'm going to mass produce a bunch of cards. If I'm die cutting pieces for a card or two, my thinking is that I might as well cut extras while I'm at it, so that I can have extra cards on hand. So making a few cards often takes WAY more time than if I would have just made a layout. I picked out a few sentiments from Kerri’s new Happy Stuff kit that would be perfect for making some cards. I’m always needing birthday cards, love to send out “hello” cards, and I thought the “that’s kind of cool” would be great for a congratulations-type card. I also cut a variety of backgrounds to create the card bases from cardstock. I think the chevron was my favorite, found in the Life Additions #2 kit. I also both a circle and a wave background for a few of the cards, found in the More Background Basics kit. I had picked out some sheets of patterned paper from a variety of 6x6" paper pads that I thought I would incorporate into the design somehow. I ended up cutting just the negative shapes from these papers, thinking I would piece them into the cardstock backgrounds. So I had cut some circles to fit into the circle background, some zig zags to fit into the chevron backgrounds, and some waves to fit into the wave backgrounds. I did end up using some of the pieces, but not quite as many as I had planned. I was working with just blue, pink, and green cardstock, and soon realized that some of the sentiments wouldn't show up that well if the backgroud was too busy. So I added a few pieces in here and there and even left them entirely off some of the cards. I wanted to keep the cards fairly flat so they would be easy to mail. By sticking to a background piece, a sentiment, and a few enamel dots, I was able to create simple cards that still have plenty of interest to them. If I'm being totally honest, these four cards are the only ones that are finished. I have backgrounds, sentiments, and extras all put aside for 8 more cards. We'll see if I ever finish them. Lol. Hey everyone! As many of you know, my blog server Typepad experienced a ton of problems over the last 5-6 days. I'd like to say that's why I haven't posted anything, but it's not. Lol. I just didn't have anything to share until today! Today we have our "Pinterest Inspired" feature up on the Bella Blvd blog. Each month, I head over to Pinterest and look for fun images that we can use for inspiration. Approximately 2 hours later, I come back with two or three images that we use for the month. Or am I the only one that can spend 2 hours on Pinterest looking for 2-3 things?!?! When I choose the images, I almost always have something in mind that I personally would do with them. We usually have three designers assigned to each inspiration image, and it's very rare that anyone ever comes close to doing what I pictured with the image. Which is exactly the point about inspiration images. They can be interpreted in soooooo many different ways. We are all inspired in different ways or by different things our eyes see in the image. That's the fun of playing along with this feature. I knew right away that I would create a background to mimic the black chalkboard in the upper portion of the inspiration image and the white table in the bottom portion of the inspiration image. I also knew that I wanted to use the black tone-on-tone star patterned paper from the Lucky Starz collection for the black. I spritzed it with some white misting spray to add a little something-something to it. I think my original plan (in my head, of course) for the bottom of the page was to leave it plain white cardstock. In cutting the flowers, I had flipped one of the pink patterned papers over and realized that the white/grey days of the week patterned papers would be perfect for the bottom portion of the page. 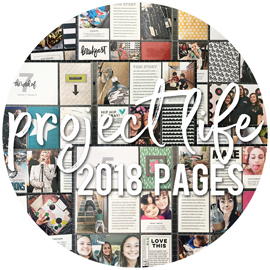 And once I had picked out my photos (one of the last things I did, to be honest), it ended up going perfectly with the theme and journaling of my page. The inspiration image had pink and white flowers in fun egg "vases", with touches of green from the leaves showing. I decided to die cut layered flowers, using my Silhouette Cameo, from pink, white, and green star patterned papers, also from the Lucky Starz collection. The Silhouette store has a ton of layered flowers and I love using them. The shape I chose had 3 layers per flower, plus the leaves, which I die cut from a darker green grid patterned paper. I added foam pop dots in between each layer, to make them more dimensional, and curled up the ends of the petals with my fingers. I finished each flower off with a coordinating threaded button in the center. I didn't have any photos in mind when I started creating this layout. Even when I decided to die cut the negative strips from Kerri Bradford's Click kit, I didn't have any photos in mind. I knew I needed four photos, since I choose the two-opening negative strip, and somewhere along the way, I realized it would be perfect for scrapping my four main daycare kids. And that journaling is true. These four do a number on me daily. I wanted to add that I don't necessarily have all four kids for 11 hours a day, and I don't necessarily have all four kids 5 days a week. I have one full-timer. The other three kid's times and days vary, sometimes changing week to week. But I am working, watching kids, 11 hours a day (start to finish), 5 days a week. I take a deep breathe before opening the door at 7:00am, when the first kid arrives, praying that I'll get through the day in one piece. And I breathe a deep sigh of relief once I shut the door at 6:00pm, after the last kid leaves, being thankful that I did indeed survive the day. Watching four little ones, all so close in age (21 months, 22 months, almost 2.5 years, and one turning 2.5 years next week), is totally draining. Yet totally fun and rewarding at the same time. If you haven't heard the news yet, Bella Blvd is coming out with three new mid-release mini collections this spring. We began revealing these collections a few days ago, and are finishing up with the last reveal today, on the Bella Blvd blog. Today we're revealing the new Classis Calendars collection. 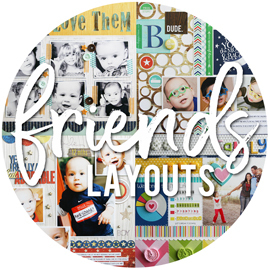 I'm sharing the last of my three new layouts today, using the new collections. Our design team will have the new collections in their creative little hands in the next few weeks, and I just know you'll be seeing lots of project inspiration on the Bella blog from them very, very soon. These new mini collections each feature six double sided patterned papers and two sticker sheets. So they're very affordable and mix and match perfectly with Bella's other collections and embellishments. The new collections begin shipping on May 12th, so you won't have to wait too long to add these to your scrapping stash! If you head over to the Bella Blvd blog, you can see this new collection it it's entirety. We are also giving the Classic Calendars collection away to one lucky reader, so leave a comment for your chance to win-it-before-you-can-buy-it (on the Bella blog, not here). We'll be announcing our winners next Monday evening. If you haven't heard the news yet, Bella Blvd is coming out with three new mid-release mini collections this spring. We began revealing these collections yesterday, and are continuing today, on the Bella Blvd blog. Today we're revealing the new Scattered Sprinkles collection. I mentioned yesterday that I was the first lucky designer to work with these new collections, and today I'm sharing the second layout that I created. If you head over to the Bella Blvd blog, you can see this new collection it it's entirety. We are also giving the Scattered Sprinkles collection away to one lucky reader, so leave a comment for your chance to win-it-before-you-can-buy-it (on the Bella blog, not here). We'll be announcing our winners next Monday evening. If you haven't heard the news yet, Bella Blvd is coming out with three new mid-release mini collections this spring. We have begun revealing these collections today on the Bella Blvd blog today, starting with the Summer Squeeze collection. I was the first lucky designer to work with these new collections, which means I'll have three new layouts to share this week, along with the collection reveals. If you head over to the Bella Blvd blog, you can see this new collection it it's entirety. We are also giving the Summer Squeeze collection away to one lucky reader, so leave a comment for your chance to win-it-before-you-can-buy-it (on the Bella blog, not here). We'll be announcing our winners next Monday evening. I've had such a great time guest designing for Citrus Twist Kits this month, and working with their fabulous April kits. I have my last project up on their blog today, and it's a short tutorial. I already mentioned in my posts here about how I altered the chipboard frames that came in the kit. But if you like visuals, or would like to see just how easy it is to get this look, head over to the Citrus Twist Kits blog, where you can see my step-by-step tutorial. 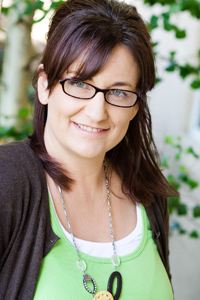 I had another layout up on the Citrus Twist Kits blog yesterday as their April Guest Designer. I contributed to their Sunday Sketch feature (you can view the sketch by clicking over to their blog). I love a good sketch, as it gives me a great starting point for my layout and I don't have to spend too much time trying to plan out my page design. I love that this sketch had 4 photos, arranged together on the page. This tied in so well with my love of photo collages. I created a simple collage with 4 photos of the girls from years and years ago and got started. I knew I wanted to add lots of interest to the background of my page, so I started by die cutting a 12x12 circle background piece from the aqua cardstock using my Silhouette Cameo. I layered my die cut background on top of a sheet of white cardstock that I lightly spritzed with black misting spray, and layered that onto a sheet of tan cardstock. I used a 1" circle punch to punch out circles from several of the patterned papers in the kit, and then adhered them randomly in the openings of the die cut background. I stamped the larger flower from the Citrus Twist Kits stamp set, using white chalk ink, onto all of the black chalkboard patterned paper circles. Once I had my photo collage adhered to the page, I tucked in some trimmed down pieces of cardstock and patterned paper on the left hand side and a few tags cut from one of the sheets of patterned paper along the top of the photo collage. I added some random machine stitching to the background of the page, and finished it off with a few of the cork butterflies included in the kit. 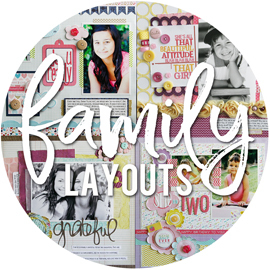 I wanted to share another layout today that I created as the April Guest Designer for Citrus Twist Kits. I still have one more layout and a card that I'll be sharing early next week. I got to work with their April main kit, Picture Perfect, as well as their embellishment kit, It Is Written. The Amy Tan tags in the embellishment kit were definitley a favorite item for me. This layout really started with the fun "XOXO" tag. I knew I wanted to focus on the orange and immediately cut out a piece from the brush script patterned paper that had the orange running down the center (and shades of pink along the sides). The heart patterned paper and woodgrain patterned paper tied in nicely, as I knew I was going to use the fun little woodchips. I cut a fun circle background piece from the woodgrain patterned paper using my Silhouette Cameo. I had already used part of this paper for another layout, so I cut it as big as I could fit on the paper (about 9x9"). Once I had that in place on my page, it helped me map out where the other patterned papers and photos would go. I also die cut a fun little heart banner garland from the black chalkboard patterned paper to string across the top of the layout. I die cut my title, "favorite moment" from the black chalkboard patterned paper, to go along with the "XOXO" tag. I rarely scrap layouts about Joe and I, but with the "XOXO" tag, it just seemed like a nice fit to use photos of the two of us. Just like in my previous layout, I chose to paint a few of the chipboard frames to coordinate with my layout better, and to help add more color to the page. I used the same technique that I used previously. I painted them with acrylic paint, ran them thru a dotted embossing folder, and then spritzed them with white misting spray. I had printed my journaling on both regular white cardstock and on the vellum that came in the kit, because I wasn't sure which one I wanted to use. At the last minute, I thought it would be fun to layer the vellum directly over the cardstock, lining up the journaling. It looks good in person, but didn't photograph very well. Lol. Now I have to share what happened AFTER I created this layout. It was completely done and I was sitting at the kitchen island typing up all of my info about it on the laptop while the kiddos were napping. I went to refill my water cup and somehow I knocked my cup over and water went ALL over the counter. OMG. My first instinct was to grab the laptop first (probably smart, right? ), then the layout, and then everything else. I only got a few drops of water on the front of the layout (right on my own photo), but the entire backside was soaked. I was so upset at myself. In all my 19+ years of scrapping, I have NEVER spilled anything on a project. And the worst part was that I still had to photograph the layout and turn it in that day. So I laid it out to dry. From the front, you honestly couldn't really tell anything had happened. I re-printed my photo and adhered it directly over the photo on the layout. I kept laying things on top of the layout to help flatten it back out, as it was warping quite a bit. I eventually adhered the entire layout to another piece of cardstock to try and flatten it more. I had to add more adhesive to the embelishments, as they were popping up from the moisture. I took all of these photos after the spill and I don't think you can tell. It's still quite warped, but all in all, I think I managed to salvage it. I still can't believe I let that happen though! 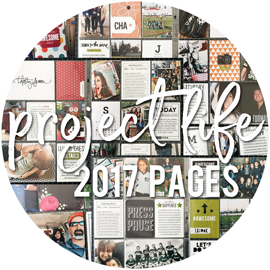 It's time for a new monthly, step-by-step, Bella Blvd project sheet! Today, on the Bella Blvd blog, we are revealing the April project sheet, which features the Max collection. I'm so glad that I have photos of my adorable daycare boys that I can use when I need to make boy layouts. I have to admit that I wouldn't normally be drawn to the sketch patterned paper, as it's not really my style. But there was one layout specifically, from one of our Bella designers, that convinced me to embrace it and see what I could do with it. I knew I would need a way to make my title stand out against the busy sketch patterned paper, so I cut a few large circles from both the navy blue robot patterned paper and a neutral grid patterned paper. For my title, I mixed the orange alpha stickers from the Max collection and the green chipboard alphas. I also hand cut the word "awesome" from one of the patterned papers to complete my title. Because they really are "awesome little dudes"! I pulled out one of the diagonal striped 3x4" cards from the Candid Cards package to use for my journaling. I matted it on some green grid patterned paper to help it stand out more, machine stitching around the outside edges. I hand cut the cute little fox from one of the 2x2" Candid Cards, and adhered him to the journaling card using pop dots. I also added the "too cool" sticker along with the fox, cutting little notches into the ends of the sticker to mimic te arrows. I also tucked a few feathers in, under my title piece. I like that the feathers can add a bit of interest and texture, without distracting from the rest of the layout. I arranged them where I wanted them, and then stapled the ends in place. Once I adhered my title piece, using pop dots, it covered up the stapled ends of the feathers. I finished off the page with a few of our older chipboard pieces and a star button. All in all, a pretty simple page. I do set out to make these project sheet layouts do-able. I keep in mind basic tools and supplies that any scrapper should have on hand, so that anyone can easily re-create the designs. You can download our April Project Sheet, featuring the Max collection, complete with full supply list and step-by-step instructions RIGHT HERE. I was excited to receive an invitation a while ago to be the April guest designer for Citrus Twist Kits. It's been a while since I have worked with a monthly kit, and I welcomed the challenge of working with a hand-picked set of coordinated products. 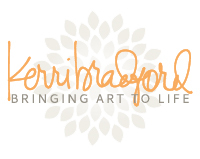 Today I am being introduced on the Citrus Twist Kits blog, where you can read a little bit about me, see a current photo of my scrapspace, and read some fun Q&A's. And I'm pretty sure if you leave a comment on THEIR blog, you'll have a chance at a little giveaway (check out the link for details). Along with my introduction, I am also sharing my first layout created with the April kit. Since Citrus Twist Kit is a mid-month release club, the full reveal of the April kit won't go up until April 5th. So you'll have a better idea of the products I was working with this coming Saturday, when the kit goes up. But for now, I'll share a bit about my layout. I loved the Amy Tangerine tags that came in the kit, and they really acted as starting points for all of my projects. I pulled out this first tag with the yellow "today" on it, and then paired it up with some pink and yellow patterned papers, and the black chalkboard patterned paper. I had cut a few little strips from a sheet of patterned paper that I thought I might use on my layout, concentrating on all the yellow ones. This "I've got sunshine" one reminded me of a photo collage that I had printed out of Sarah forever ago, but had never used. This was a selfie that she had taken with her iPod, edited on her own, and created this four photo collage. I thought it was super cute and printed it. And so my title was born. Hello Sunshine. I used my Cameo to cut the "Hello" from the black chalkboard patterned paper, and the "Sunshine" from yellow patterned paper. There was a variety of Maggie Holmes Styleboard Frames in the kit, and I knew I wanted to incorporate them on all of my projects. I wanted the larger square one for this layout, but as-is, it wasn't working for me. I wanted to bring more pink into the page, to go along with the pink patterned paper strips along the top and bottom of the page, so I decided to paint it pink. I brushed on a few coats of pink acrylic paint and let it dry for quite a while. Then I ran the frame thru a dotted embossing folder to give it more texture. The pink ended up being just a tad too bright for my liking, so I spritzed it with some white misting spray. I die cut a fun layered sun with my Cameo, using the same yellow patterned paper that I used for part of my title. I cut the center circle twice, making one slightly smaller, just to add some extra interest. I machine stitched around each of them and then layered them all together, adding the fun black polka dot badge to the center. I'll be sharing a few more projects during the month. Don't forget to check out their site if you're in the market for a fun kit!